Driving in winter weather can be scary and even dangerous. There are some things you should keep in mind before you head out, especially if it is snowy or icy. AAA has some tips for getting safely to your destination. Don’t drive when you are tired. Winter driving is challenging enough without the fatigue factor. Don’t warm up your vehicle by letting it run in a garage or other enclosed area where deadly gases could build up. Keep your tires properly inflated and your gas tank at least half full. Don’t use cruise control unless you are driving on dry pavement. Use your seat belt whenever you drive. Keep your eye on the weather before heading out on a long drive. If possible, don’t make the trip if bad weather is forecast. If you must go, let someone know your route and estimated time of travel. Have a mechanic inspect your vehicle to make sure it is in proper operating condition before you start your trip. Make sure to have with you a charged cell phone, water, essential medication, blankets and warm clothes. If you get stuck in the snow, don’t leave your vehicle. It can shelter you, and it is easier for rescuers to find your vehicle than to find you on your own. Tie a bright cloth to the antenna or hang one out your window. If your dome light still works, leave it on at night so that rescuers can see your car more easily. 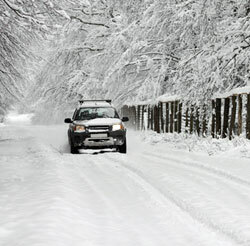 If your car is stuck, don’t overexert yourself trying to dig or push it out. You don’t want to have a medical emergency so far from help. Check to make sure your exhaust pipe is not blocked or clogged. If it is not, run the car and heat just long enough to take off the worst of the chill. Do everything more slowly. Accelerate, decelerate and stop more slowly than you would on dry pavement. Drive more slowly, too, to give yourself more time to react. Know how to use your brakes. With anti-lock brakes, you can press hard on the pedal to stop. Never pump anti-lock brakes; the brakes do the pumping for you. But if you don’t have anti-lock brakes, use the ball of your foot to gently apply and release pressure to the pedal. Don’t keep steady pressure on the brakes, and don’t stomp on the brakes, because that can cause you to spin out of control. Avoid stopping if possible. For example, if you can slow down enough that you can avoid reaching a red light before it changes to green, you won’t have to hit the gas as much to get back to speed. Know how to handle snowy or icy hills. Don’t gun the accelerator to go up; instead, try to build up inertia and let it help you. And don’t stop on a hill, because it can be very difficult to maintain control when you start up again. If the weather is bad, just stay home if at all possible. Remember that even if you are a good winter driver, a lot of the other people on the road with you probably are not.